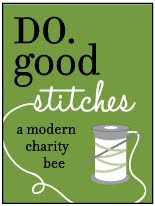 I figure that the beauty of a new blog is that I can pull out some "oldies" for Sew and Tell, right? 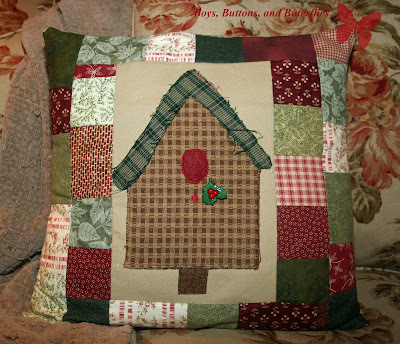 This is a pillow cover for Christmas. I, of course, used ALL scrap fabric to finish this! The birdhouse is brown upholstery fabric I found in the remnant section of the fabric store. The rest are different cottons. The center background square is a scrap of twill (hard to see...didn't take the best photo!) The birdhouse opening is a piece of felt. 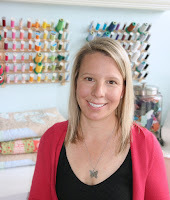 I just added a mistletoe button for embellishment! By the way....I did make this LAST year, so not soo old. 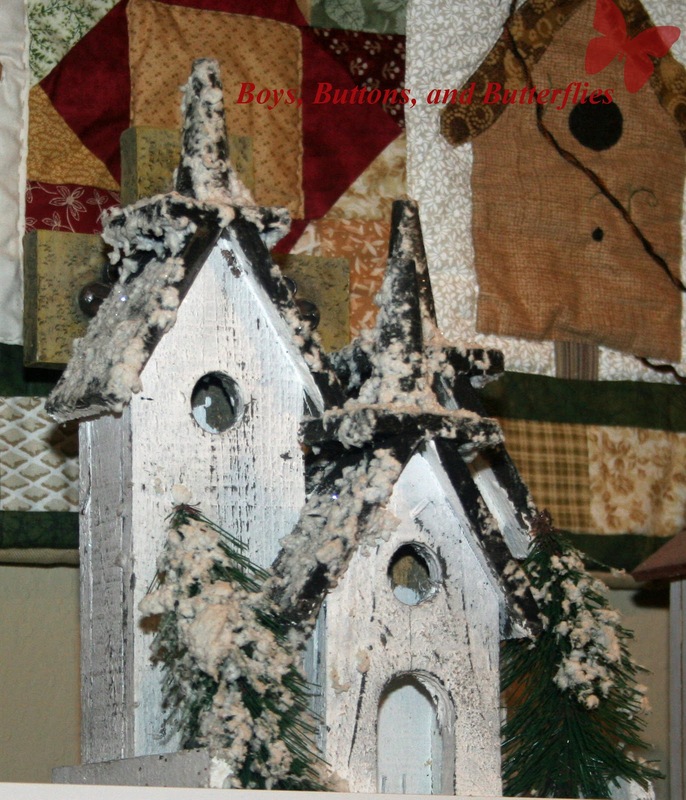 If you are wondering...why the birdhouse? Well, if you have seen my Climbing post﻿, you might have noticed this quilt (below) in my studio above the cabinets on one side. 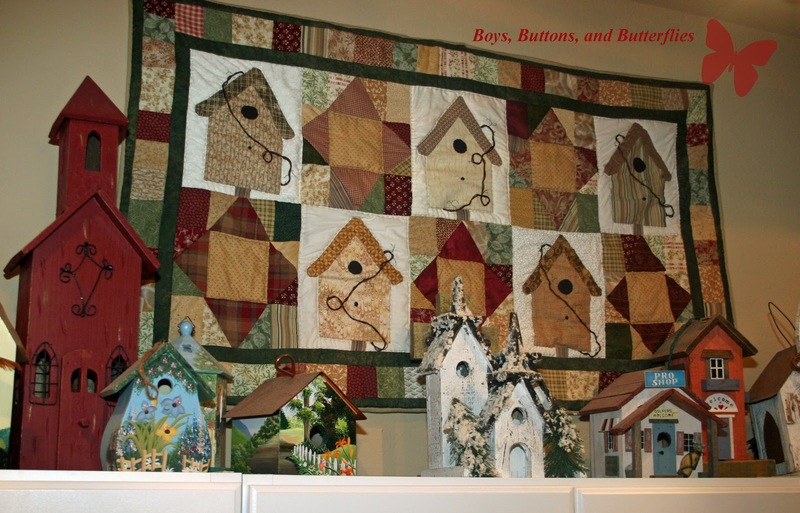 The inspiration for the quilt was the collection of birdhouses. They used to belong to my very FAVORITE grandmother. She and my grandfather decided to move from their awesome lake house, to a retirement community a few years ago. Unfortunately, for her, she couldn't take them with her. Fortunately for me, I was the only one who asked for them and received them! I must confess that the boys and I are a bit addicted to adding to them. This year, JJ insisted I needed a Christmas one. I wanted a diferent one, but he liked how it had more than one house. So now I will have to be saavy and think of a great embellishment! I love that you bought the one your son liked, instead of the one you were leaning toward. And that you know why he liked that one. It's a great collection, and I might have to try a wall hanging like that one, too.